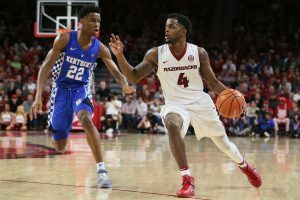 In another SEC match-up this weekend, the Arkansas Razorbacks will travel and face the Alabama Crimson Tide on Saturday evening. The teams’ last match-up was a little over a year ago when Arkansas came out on top. They defeated Alabama at home 87-68. In fact, the last time Alabama beat Arkansas was in 2014, when they won 83-58. So will the Razorbacks extend their streak of defeating the Crimson Tide? Or will Alabama snap it? Right now, the Razorbacks have a 19-9 overall record, are 8-7 in conference play and tied with Alabama for 3rd in the SEC. Looking back at their accomplishments and struggles as the last few regular-season games are on the horizon, the Razorbacks started off on the right foot going 11-2 in their first 13 games of the year. Granted, although only one of those games was in conference play in which they beat Tennessee 95-93 in OT, it helps illustrate how they found their rhythm early ahead of SEC play. 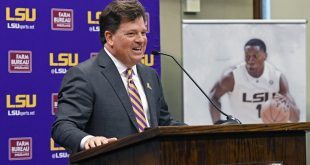 When they started SEC play though they hit a few speed bumps. However, they quickly found their groove again. 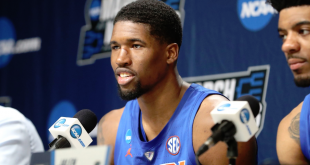 In their last five games, they have gone 4-1 taking down South Carolina, Vanderbilt, Ole Miss, and Texas A&M, just before losing to Kentucky 87-72 at home. The Razorbacks are averaging 82.4 points, 35.1 rebounds and 14.9 assists per game while allowing 75.6 points. And currently, their team leader in points per game is senior guard Jaylen Barford who is averaging 18.4. Just like Arkansas, the Tide are coming off an SEC loss as well. On Wednesday, they were defeated 90-71 by in-state rival no. 12 Auburn. 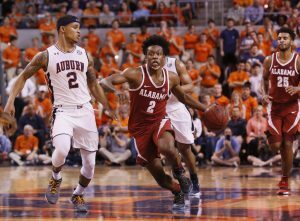 Wednesday’s defeat made it their second consecutive loss having lost to Kentucky before Auburn. Not to mention, both games were road losses. So maybe a good dose of home court advantage could help the team turn things around. Right now, Alabama is 17-11, 8-7 in conference play and like mentioned above, tied with Arkansas for 3rd in the SEC. For most of their season, Alabama has volleyed between wins and losses. In their last 10 games, they split wins and losses 5-5. 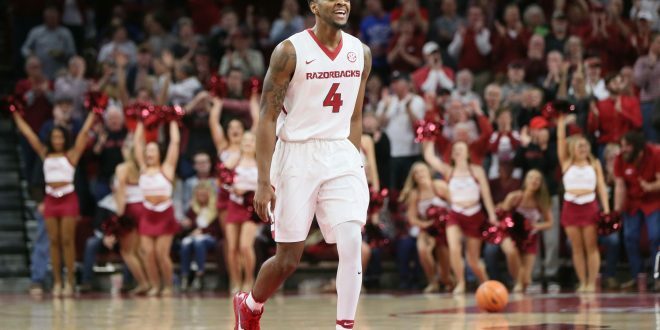 Ahead of Saturday’s match-up head coach Avery Johnson spoke highly of his friend Mike Anderson’s team in Arkansas and what the Razorbacks’ key is. 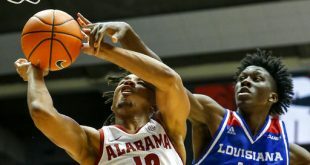 Currently, Alabama is averaging 73.4 points, 36.1 rebounds and 12.9 assists per game, while allowing only 69.4 points. Their current team leader in points per game is freshman guard Collin Sexton, who like Barford, is averaging 18.4. Which SEC team will come out on top? Will Arkansas make it to 20 wins and a five-season win streak over Alabama? Or will Alabama utilize home court advantage and come out on top? The Razorbacks and Crimson Tide will take the court tomorrow night in Coleman Coliseum in Tuscaloosa, Alabama. Game time is set for 6 p.m. and will air on the SEC Network.